Levels of haemoglobin A1c (HbA1c) and blood lipids are important determinants of risk in patients with diabetes. Standard analysis methods based upon venous blood samples can be logistically challenging in resource-poor settings where much of the diabetes epidemic is occurring. Dried blood spots (DBS) provide a simple alternative method for sample collection but the comparability of data from analyses based on DBS is not well established. We conducted a systematic review and meta-analysis to define the association of findings for HbA1c and blood lipids for analyses based upon standard methods compared to DBS. The Cochrane, Embase and Medline databases were searched for relevant reports and summary regression lines were estimated. 705 abstracts were found by the initial electronic search with 6 further reports identified by manual review of the full papers. 16 studies provided data for one or more outcomes of interest. There was a close agreement between the results for HbA1c assays based on venous and DBS samples (DBS = 0.9858venous + 0.3809), except for assays based upon affinity chromatography. Significant adjustment was required for assays of total cholesterol (DBS = 0.6807venous + 1.151) but results for triglycerides (DBS = 0.9557venous + 0.1427) were directly comparable. For HbA1c and selected blood lipids, assays based on DBS samples are clearly associated with assays based on standard venous samples. There are, however, significant uncertainties about the nature of these associations and there is a need for standardisation of the sample collection, transportation, storage and analysis methods before the technique can be considered mainstream. This should be a research priority because better elucidation of metabolic risks in resource poor settings, where venous sampling is infeasible, will be key to addressing the global epidemic of cardiovascular diseases. Cardiovascular diseases  are increasing particularly rapidly in developing country settings with diabetes a key determinant of risk . Documenting the role of dysglycaemia and other metabolic risk factors [3–8] can be challenging in these countries because the infrastructure and resources required to conduct research are limited. For example, assays of glycosylated haemoglobin (HbA1c) and blood lipids are usually done on venous blood samples which can be difficult to collect, transport and store. The use of dried blood spot sampling (DBS) [9, 10] is one possible solution. DBS involves pricking the participant’s finger with a lancet and collecting drops of blood on a piece of filter paper. Samples are then dried and placed in sealed plastic bags for transportation and storage [11, 12]. Compared to venous samples, collecting DBS requires minimal training of staff, is cheaper, is safer, provides for simpler transportation and is more acceptable to study participants [12–15]. DBS samples are now widely used for measuring serum antibodies, human immunodeficiency virus (HIV) loads and blood hormone levels with good data to define the comparability of results between analyses based upon DBS and standard venous samples [11, 14, 16, 17]. The absence of comparable data to define the associations for HbA1c and blood lipids means that DBS samples are not widely used in studies making assessment of cardiovascular risks. The objective of this project was to synthesise the available evidence describing the comparability of findings for assays of HbA1c and blood lipids based upon DBS samples compared to standard venous samples. 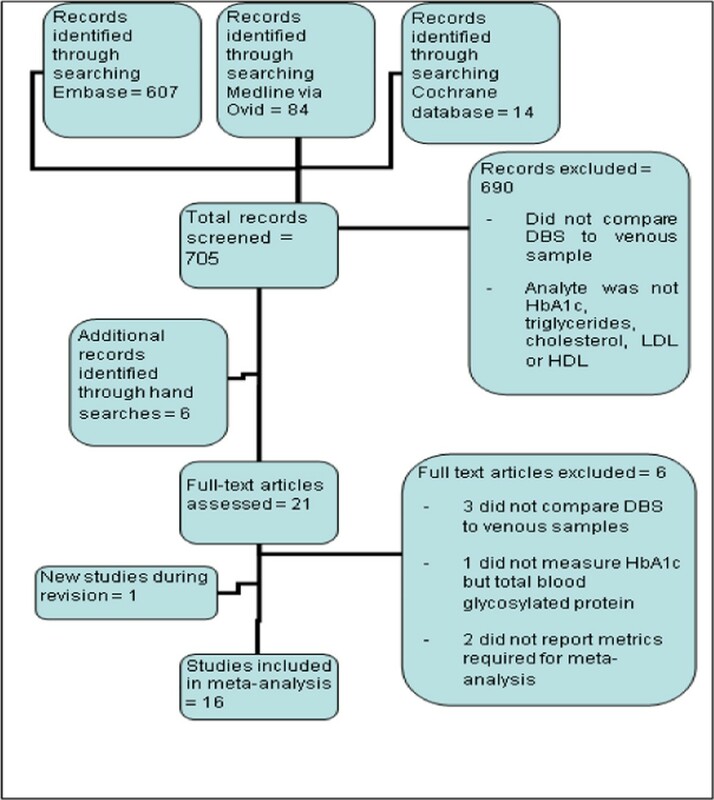 This project was a systematic review and meta-analysis done to define the association of findings for HbA1c and blood lipids for analyses based upon standard venous samples compared to DBS samples. This was a secondary analysis of existing published data and no ethics review was therefore required. The Cochrane, Embase and Medline databases were searched electronically during July 2012 using combinations of the terms “dried blood spot”, “dried blood”, “DBS”, “filter paper”, “triglycerides”, “triacylglycerides”, “HbA1c”, “glycosylated haemoglobin”, “glycosylated hemoglobin, “glycated haemoglobin”, “glycated hemoglobin, “cholesterol”, “high density lipoprotein”, “HDL”, “low density lipoprotein” or “LDL”. Additional studies were identified by a manual examination of the reference lists of all studies identified as eligible. Studies were eligible for inclusion if they directly compared values generated from analyses based on DBS samples to analyses based on venous samples. To be included, a study had to report in the form of a regression equation an association for one or more of the specified outcomes. There was no restriction on the type of study population. Two independent observers (EA and PD) reviewed the abstracts for eligibility and extracted standardised data into a data collection sheet for eligible studies. The data sought from each study were based upon a comparable prior systematic review done in the HIV field  and included: date of publication, study size, participant characteristics and sample storage conditions. For each risk factor reported upon we sought to identify the laboratory extraction method, biochemical assay method and regression coefficient. Where available we also noted data describing the stability of the DBS samples. The outcomes studied in this overview were HbA1c, total cholesterol, high density lipoprotein (HDL) cholesterol, low density lipoprotein (LDL) cholesterol and triglycerides. where the weight, w i = the number of participants in study i, and bi and ai represent the coefficient and intercept, respectively, for the regression line in study i. *Some studies provided multiple estimates and are repeated in the table. SD = standard deviation, DBS = dried blood spot, V = venous. Heterogeneity of the individual study estimates contributing to each meta-analysis was assessed using the Cochran’s Q and I2 statistics. Subsidiary analyses were done to explore the impact of assay method for the outcome of HbA1c. There were 705 records identified by the electronic search for which abstracts were reviewed. Six further studies were found by the manual search of reference lists for included studies (Figure 1). One final study was found during the review process. Sixteen studies were ultimately included in the meta-analysis, 12 of which reported necessary data for HbA1c, 1 for triglycerides, 2 for both triglycerides and total cholesterol and 1 for HbA1c, total cholesterol and HDL (Tables 1, 2) [9, 10, 19, 21–34]. One other study of HbA1c was excluded because it did not provide a regression equation  and one other study of triglycerides was excluded because it did not provide the sample size . There were no studies reporting data for LDL-cholesterol identified. Flow chart detailing identification of studies. *Some studies involved multiple samples and are repeated in the table. The total numbers of participants providing data were 1425 for HbA1c, 773 for triglycerides and 1093 for total cholesterol. Study sizes ranged from 30 to 613 participants. The assay methods varied for HbA1c which included immunoturbidimetric, high performance liquid chromatography (HPLC) and affinity chromatography assays but all studies measuring triglycerides, total cholesterol and HDL used colorimetry. 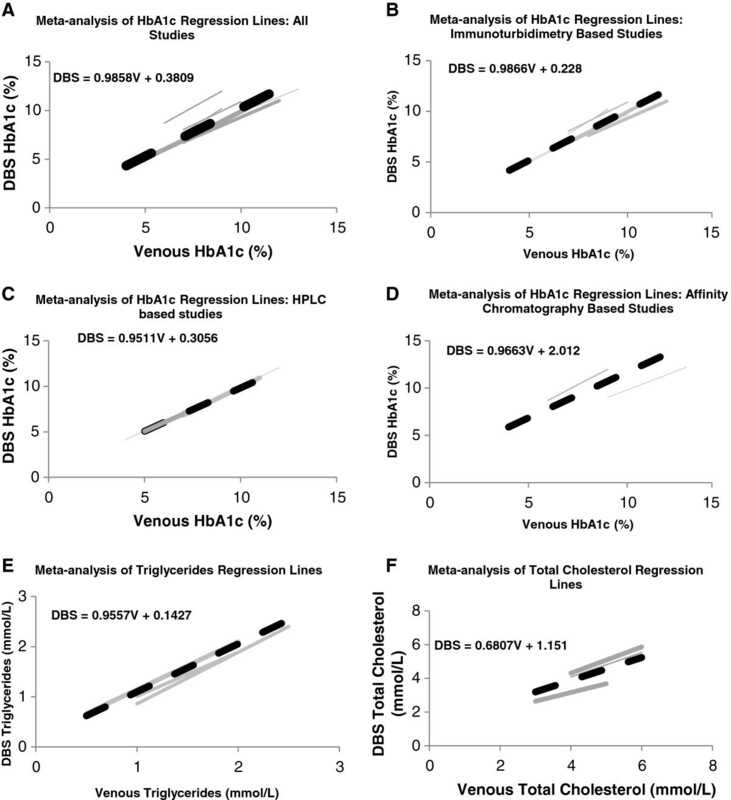 For HbA1c the summary regression (DBS = 0.9858 V + 0.3809) (Figure 2) showed close agreement between analyses based upon the venous and DBS sampling methods. There was, however, evidence of heterogeneity between the contributing regression lines for the intercepts (Cochran’s Q-test p < 0.001 and I2 = 98%) but not the slopes (p = 0.833 and I2 = 0%). Subsidiary analyses by assay method showed that the heterogeneity was partially attributable to different results for the two studies that used affinity chromatography. Funnel plots did not provide clear evidence of publication bias (Additional file 1: Figures S1 and S2). Individual (solid) and summary (dotted) regression lines showing the associations between results for analyses based upon dried blood spot (DBS) compared to venous (V) samples for haemoglobin A1 c (HbA1 c ) analysed by any method (2A), HbA1 c analysed by specific methods (2B to 2D), triglycerides (2E) and total cholesterol (2E). - Thickness of line increases with sample size. Line length was defined as ±1 standard deviation (SD) of the study (or overall) mean. Where the mean or SD of a study was not available the average for that analysis was used. The summary regression line for total cholesterol (DBS = 0.6807Venous + 1.151) (Figure 2) indicates a requirement for moderate adjustment of values based upon analyses of DBS samples to obtain estimates equivalent to standard analyses based upon venous samples. The regression lines for the two studies contributing to this meta-analysis were directly comparable in terms of both slope and intercept although both were derived from studies done at the same investigational centre. For triglycerides, the summary regression for the three contributing studies showed a close association between the results obtained for the two methods (DBS = 0.9557Venous + 0.1427) (Figure 2) without any evidence of heterogeneity between the three results. Only one data set was available for HDL. Data about the circumstances and duration of storage of DBS samples were inconsistently reported with few data to describe whether the analysis findings were affected by extended storage duration or different storage temperatures. From the limited data available it was concluded that DBS samples collected for assay of HbA1c and intended for HPLC analysis can be stored for 5 days at room temperature or for up to 3 years at −70°C [9, 11, 23]. If analysis by immunoturbidimetry is planned, the data variously suggest that samples can be stored safely at room temperature for up to 44 days , at 4°C for up to 15 days  and storage at −80°C for up to 3 months . For total cholesterol samples were reported as stable for up to 1 month at room temperature [30, 32] and up to 3 months at 4°C , and for triglycerides up to 1 month at room temperature and up to 2 months at 4°C . These analyses identified clear associations between assay results based upon blood samples collected using traditional venous approaches and blood samples collected using DBS techniques, for both HbA1c and selected blood lipids. The data provide a strong rationale for the further investigation of DBS sample collection techniques although also serve to highlight a number of areas that require further exploration before the method is considered mainstream in this field. If, however, standards and calibrations can be agreed, as has been achieved in other fields of research [23, 31, 37], the DBS method does appear to have significant potential to address the logistical challenges of venous sampling for studies of metabolic risks in resource poor settings . The differences between the intercepts of the regression lines obtained for the various analytic methods used for assay of HbA1c require careful consideration in terms of their implications. If the variation is due to the analytic method selected then it will be necessary to recommend a standard approach for each analyte of interest. However, while the analytic method is the obvious explanation for the observed variation it is not possible to exclude alternative causes on the basis of the available data. For example, other aspects of the preparation of the DBS samples such as transportation and extraction were not standardised across the different analytic methodologies and might also be a cause of the differences noted. The incomplete and summary nature of the data available for analysis placed significant constraints upon the extent to which the results could be explored in this overview. In particular, measures of variance of the data were unavailable for most contributing studies, requiring that weighting be done by sample size alone  with consequent limitations upon the methodologies that could be used to present uncertainty intervals around both the individual studies and the summary estimates. For example, we identified a possible relationship between the regression parameters and the mean HbA1c of the contributing studies suggesting that both the intercept and the slope might change when HbA1c rises above 8% (Figures 3 and 4). This implies a non-linear association of venous with DBS sample results that might require a more nuanced explanation than the simple linear regressions provided here . Removing the studies with high average HbA1c levels from the meta-analysis resulted in a regression line approaching parity (DBS = 0.9553 V + 0.2566) and with a reduced heterogeneity for both the slopes (I2 = 0%) and the intercepts (I2 = 92%). However, whether this simply reflects a chance finding in the data, or a true variation of the association by mean HbA1c level is still uncertain. Likewise, several studies used the same patients for two rounds of analysis [21, 28] and there would therefore have been some correlation between the findings for each. This would not be expected to substantially change the parameter estimates obtained but certainly would increase the uncertainty around them. Our inability to create robust uncertainty intervals around our estimates is the primary weakness of this piece of work. Unfortunately the lipid analyses were even less rigorous, with so few studies, confidence in the meta-analysis is limited. There is much potential for further work in this area to generate reliable regression analyses for use in the field. 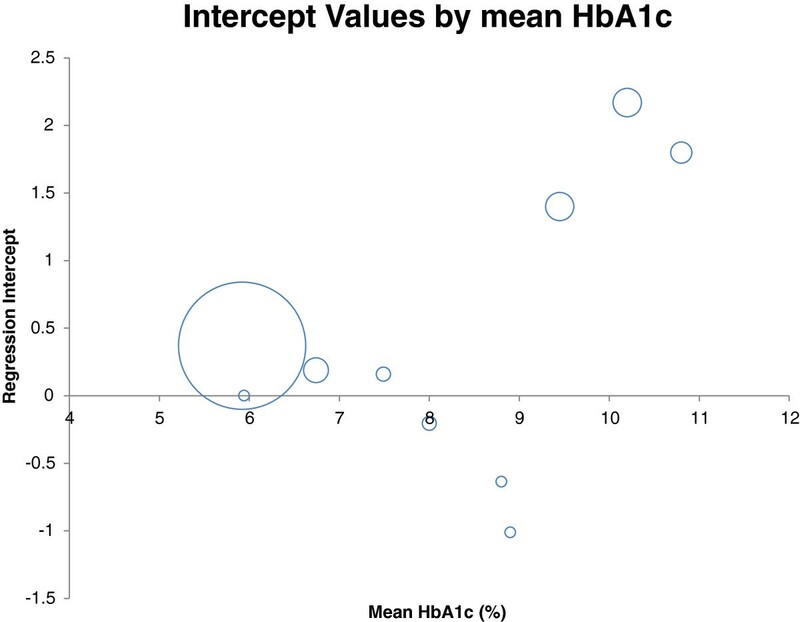 The mean HbA1c values from the studies are compared with the regression intercept the study generated. The marker size is proportional to study size. 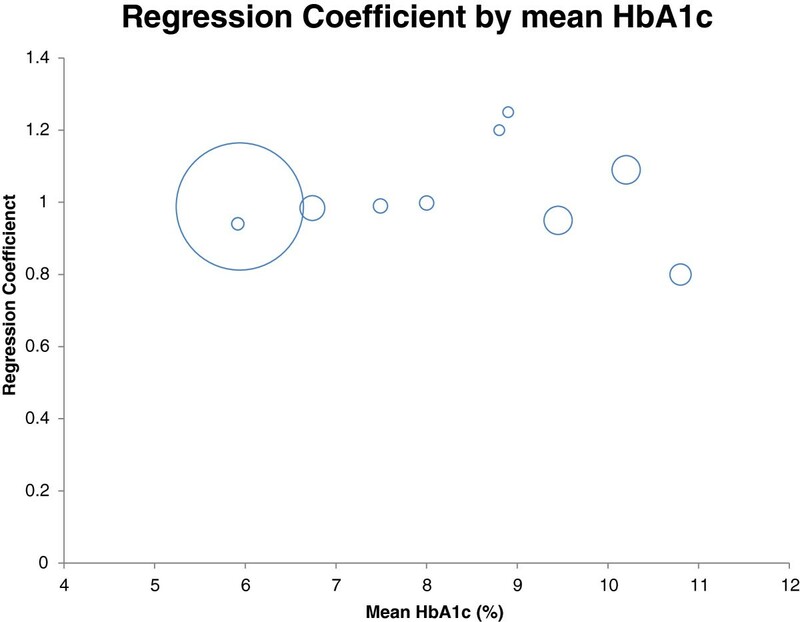 The mean HbA1c values from the studies are compared with the regression coefficient the study generated. The marker size is proportional to study size. On a more positive note, the association between results based on venous and DBS samples appeared to be consistent at the levels of HbA1c at which diabetes mellitus is diagnosed (HbA1c > 6.5% ). This implies that DBS samples could already be used for determining the presence or absence of diabetes with reasonable certainty, although measures of the extent to which blood glucose is controlled amongst those with diabetes would be less reliable. Most of the studies reported some information about DBS sample preparation, transport and storage but the data were provided in diverse formats and were substantively incomplete. While it appears likely that DBS samples are stable for adequate periods of time this is an area that requires systematic evaluation and the development of standardised recommendations prior to widespread roll out of the methodology. The establishment of World Health Organization ‘’25 by 25” target for the prevention of non-communicable diseases  has added urgency to the need for data about the metabolic determinants of cardiovascular risk. With more than three quarters of all chronic disease now occurring in developing country settings, the introduction of low cost research techniques that will provide the data required to inform government decision making is a priority . DBS sample collection methods appear to have great potential for the evaluation of cardiometabolic risk factors at the population level [9, 13, 27] enabling data collection at scale in areas previously unstudied . There remain, however, important advances to be made in defining standard methodologies and adjustments before the DBS sampling method is confirmed as a sound proxy for traditional venepuncture samples for these types of blood analytes. Bruce Neal is supported by an Australian Research Council Future Fellowship (DP100100295) and a National Health and Medical Research Council of Australia Senior Research Fellowship (APP100311). Clara Chow is supported by a National Health and Medical Research Council of Australia Career Development Fellowship (APP1033478 ) co-funded by the Heart Foundation and a Sydney Medical Foundation Chapman Fellowship. D Praveen is supported by the Australian Agency for International Development (AusAID). There are no conflicts of interest to be declared. EA drafted the manuscript and researched data. PD researched data. CC reviewed/edited the manuscript. BN contributed to the study design and re-drafting of the manuscript. Guarantors are EA and BN. All authors’ read and approved the final manuscript. The NCD Alliance: Final Comprehensive Global Monitoring Framework for NCDs. [http://ncdalliance.org/sites/default/files/rfiles/GMF_Final%20Table%20of%20Targets.pdf]. Accessed May 2014.